Wondering if you could sell more of your products by experimenting with different pricing offers, or perhaps capture more sales by presenting your existing pricing promotions differently? Here’s consumer psychology you can use to structure your pricing in a way to will boost website conversion and response to your marketing pieces, and tempt the customers you’ve already won to buy more. Comparative pricing. There’s a reason that major retailers reference how their price compares to their competitors; it works! 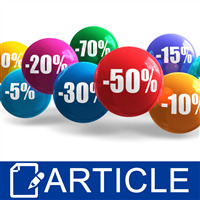 According to the study “An examination into the Effectiveness of Two-Sided Comparative Price Appeals,” the “two-sided” nature of the comparative price approach makes consumers feel as though they’ve been given the “whole story” behind their purchase decision, reducing their need to price compare on their own. Because the study also indicates that making a comparison to a leading brand creates a perceived similarity to the market leader in the customers’ mind, the strategy is particularly effective for small business owners. The key to effective comparative pricing, however, is to ensure that your claims are both factual and believable. Researchers in the study also found that there is a point at which the savings you demonstrate can be too great, leading consumers to either not believe the information, or conclude that your product is a lower quality than the competitors, to explain the significant price difference. How do you know which “price spread” is too much? Test it out! Email, targeted social media campaigns and even custom landing pages can help you explore different price savings comparisons to analyze which generate the most email opens, online “clicks” activity, and web store conversions. Percentage discounts. Percentage discounts to promote products isn’t a new idea, but did you know that the format you use to describe the offer can have a major impact on response? In the same study noted above, scientists found that research participants indicated the greatest likelihood of purchase intent after viewing advertising that included a products’ original price, the sale price AND the percentage off, versus marketing efforts that promoted only a percentage discount. End the need to price compare. Technology has empowered customers to verify the pricing of your products (and potentially find it for a lower price elsewhere) in a matter of seconds. You can do the “heavy lifting” for them and reduce shopping cart abandonment by including a reference of the price a few of your competitors sell the product for on your site—especially if your price isn’t always the lowest. (Your honest acknowledgement builds credibility). When that is the case, offset the potential deterrent by reinforcing the other benefits buying from your business entails, and possibly, offering to match any competitor’s price. (This strategy helped Best Buy reclaim sales it was losing to Amazon and other lower-priced web stores who were selling the same product for less). Lead with the number when packaging offers. Package pricing (like 2 soaps for $10) can boost your average order value, give you compelling reasons to market to customers via email and social media, and offset the costs of other value-added benefits (like free shipping), but a 2011 Virginia Tech study revealed that how you structure the offer actually has more impact to response than the offer itself. Researchers in the study found that placing the quantity of the promotion before the dollar amount (as shown in the example above) has more consumer appeal than leading with price. They found that information to be especially relevant when the structure of the offer makes it difficult for the buyer to calculate the price of one item. (For example, three soaps, lotions or candles for $22).